High resolution mass spectrometry imaging has been used to study endogenous metabolites from biological tissues. The localization and the identification of small molecules involved in the main metabolic pathways can be achieved thanks to a FTICR mass spectrometer and a MALDI ionization source. It allows the possible discovery of new therapeutic targets, the obtention of valuable pharmacodynamics data or the characterization of most of the metabolism pathways in animal models. By definition, metabolites are intermediates and products from different metabolisms. More commonly, they are small compounds found in organisms and have an important role in cells life and survival. Each of them can have a specific function and represents a marker of a biochemical process. They can be nucleotides, amino or organic acids, lipids… Their identification permits the deconvolution of major biological pathways (TCA or Urea Cycle, Purine metabolism, Glycolysis…) and the better understanding of pathologies mechanism (Cardiovascular disease, Diabetes, Cancer, Inflammatory diseases…). Different techniques such as Nuclear Magnetic Resonance (NMR) or Mass Spectrometry (MS) can be used to characterize these molecules. Fourier Transform Ion Cyclotron Resonance Mass Spectrometry (FTICR-MS) is commonly chosen to study complex biological mixtures thanks to unmat-study complex biological mixtures thanks to unmat-ched mass resolution, high mass accuracy and structu-ral characterization. Therefore, FTICR is the instru-ment of choice for metabolite profiling in tissue in combination with MALDI ionization source. The application of Mass Spectrometry Imaging (MSI) in the study of endogenous metabolites from biological tissues is a quite recent but promising technique which offers to simultaneously monitor several compounds (drug and metabolites) with spatiotemporal informa-tion about molecular behavior[2,3]. In this respect, it can be a valuable tool for pharmacodynamics (the study of biochemical and physiological effects of drugs on organism) to understand drug efficacy and potential toxicity in drug preclinical development. Brain, Liver and kidney tissue sections from control rat were carried out with a Microm cryostat HM560 (Thermo Scientific, USA), at 10 μm thickness. All sections were mounted on conductive ITO glass slides, and then dried. The matrix was adapted to negative ionization polarities; the 9 amino-acridine (9AA) was choice and applied using SunCollect Automated Sprayer (SunChrome, Friedrichsdorf, Germany). MS images were acquired with a SolariX 7.0T MALDI-FTICR mass spectrometer (Bruker Daltonics, Bremen, Germany) equipped with a SmartBeam II laser used at a repetition rate of 1000Hz. All instrumental parameters were optimized before the imaging experiment on adjacent tissue sections. Negative mass spectra were acquired within the 100- to 1200-m/z range. The mass spectrometer was operated in the fullscan mode (with on-line data reduction and the accumulation during detection mode) and the mass spectrum obtained for each image position corresponds to the averaged mass spectra of 500 consecutive laser shots at the same location. MALDI Images were performed on the different organs at a spatial resolution of 110 μm (around 10000 voxels depending of the tissue dimension). 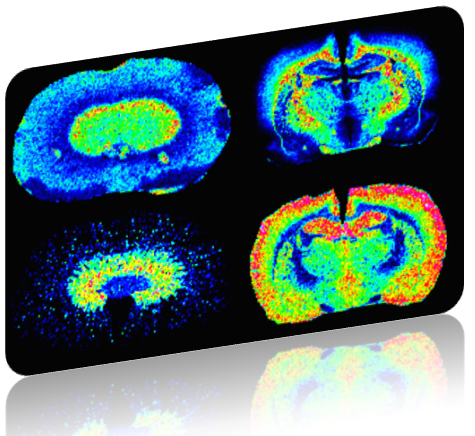 MS Images were visualized using Quantinetix software (ImaBiotech, France). Cryosections of tissue were stained with hematoxylin and eosin (H&E) solution after MSI analyses in order to localize fine histological structures. – AMP or Adenosine monophosphate (m/z 346.0575); AMP could be produced during ATP synthesis using adenylate enzyme by combining two ADP molecules. Energy-state of cells or tissues which control the entire metabolism can be directly assessed using these metabolites. – GMP or Guanosine monophosphate (m/z 362.0506); GMP is essential in the activation of G proteins which is involved in signal transduction. – IMP or Inosinic acid or inosine monophosphate (m/z 347.0396); IMP has a central position in Purine Metabolism, (the first nucleotide formed during the synthesis of purine). IMP act as the common intermediate of AMP/GMP synthesis. metabolic pathways and molecular imaging of different species. We are able to detect the Glucose 6-Phosphate (m/z 259.0224) which is implicated in glycolysis that converts glucose to pyruvate. Some intermediate, as the glycerol 3-phosphate (m/z 171.0064), can also be monitored in this pathway to have complementary data about metabolism efficacy. The glycolysis plays an important role in the activation of the Krebs cycle that is due to Acetyl-CoA or oxaloacetate production. Its deregulation could be involved or associated to disease development (Cancer, Alzeihmer disease…). We can follow the Krebs cycle operating thanks to the monitoring of the malate (m/z 133.0320) and the citrate (m/z 191.0620) molecules. In fact, these two metabolites can represent some biomarkers of the beginning and the end of Krebs cycle process. Moreover, the Glutamate (m/z) and the aspartate (m/z) can also be used as indirect indicator of oxaloacetate and !-ketoglutarate metabolism. The correlation of the metabolites distribution in tissue with their role in metabolism may provide a new insight into the understanding of metabolic dynamics. High resolution mass spectrometry imaging was successfully applied to study in-situ metabolism and to characterize specific biological pathways.With this techniques, hundreds endogenous metabolites from different classes could be monitored simultaneously in the same experiment and could give, at the same time, their precise localization. Also at ImaBiotech, we have generated a database of a few thousands of endogenous metabolites to accelerate the metabolite research in biological samples. In conclusion, high resolution MSI might become a tool of choice for better understanding of the metabolic pathways in biological tissues and for pharmacodynamics studies, for biomarker or therapeutic target discovery.